Port­land band Mim­ic­k­ing Birds began as the home record­ed solo project of now front­man Nate Lacy. Since its hum­ble begin­ning, the group has gone on to tour with Mod­est Mouse as well as be signed to Mod­est Mouse front­man Isaac Brock’s new label, Glacial Pace. The Birds’ first, self-titled, album was released on the 9th and apt­ly demon­strates Lacy’s cre­ativ­i­ty as well as Mim­ic­k­ing Birds’ poten­tial as a full-fledged group. Most­ly com­prised of acoustic gui­tar, though inter­spersed with per­cus­sion synth, and some elec­tric gui­tar, the instru­men­tals of Mim­ic­k­ing Birds are del­i­cate and gen­er­al­ly unadorned, though not to enough of an extent that they become any­thing close to a side attrac­tion next to the vocals. In fact, they strike a near per­fect bal­ance between tech­ni­cal facil­i­ty and musi­cal vari­a­tion. One of the best tracks, “Rem­nants and Pic­tures,” mod­u­lates through emo­tion­al­ly pow­er­ful but dynam­i­cal­ly del­i­cate moods, result­ing in a heav­i­ly emo­tion­al and sim­ply beau­ti­ful track. Lacy’s vocals are quite well suit­ed to the sort of slow, nuanced music that Mim­ic­k­ing Birds plays - soft and near-plain­tive, with occa­sion­al quirks that make him sound even bet­ter. Lacy does occa­sion­al­ly slip into mum­bling, and the sibi­lant sec­tions which nor­mal­ly accen­tu­ate the instru­men­tals are occa­sion­al­ly a bit too overt. How­ev­er, for the most part, Lacy’s voice just plain works. There’s not much vocal vari­a­tion across the album (though a few tracks dis­play impres­sive use of vocal har­monies), but giv­en that it’s so suc­cess­ful, this isn’t much of an issue. So regard­less of any of its small faults, Lacy’s vocals are respon­si­ble for a great deal of Mim­ic­k­ing Birds’ suc­cess. 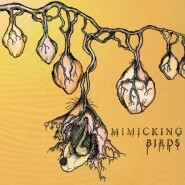 As can be expect­ed from a band like Mim­ic­k­ing Birds, the album falls very clean­ly into its well defined sub-genre. Unfor­tu­nate­ly, the sub-genre the band has cre­at­ed is small enough that, while most of the tracks on Mim­ic­k­ing Birds sound suf­fi­cient­ly unique, one still feels like the album lacks any real sort of diver­si­ty. This is not to say that the album does not do well in its lim­it­ed range of sounds - it, in fact, does excel­lent­ly. It does, how­ev­er, leave a mark on the album. Though much of Mim­ic­k­ing Birds is very, very strong, it still seems that the album was not at its utmost best. With Mim­ic­k­ing Birds, Mim­ic­k­ing Birds has made a strong entry into the larg­er music indus­try. There is noth­ing on the album that is any­thing like bad. Tracks on the album range from good to excel­lent, very few of which are “only” good. Record­ing qual­i­ty is spot on, vocals are slight­ly quirky but strong, over­all sound doesn’t vary much, but has cer­tain­ly cen­tered in a sweet spot, and Nate Lacy has more than a way with words. Most of Mim­ic­k­ing Birds’s flaws are very minor, so the band will need very lit­tle luck to make strong improve­ments before the release of a sec­ond album.